” Last year, we led a massive group listening program – the My Life My Lead consultations involved 600 people at 13 forums across Australia, plus more than 100 written submissions were received. Seven priority areas were identified, and are informing the current Closing the Gap refresh agenda. We need to be fully committed to sitting down and listening; hearing what’s being said, and continuing to invest in programs that do their work from the ground up. Good parenting rather than increased funding for programs and services is key to improving Indigenous health, the federal minister responsible for the sector has ­declared. 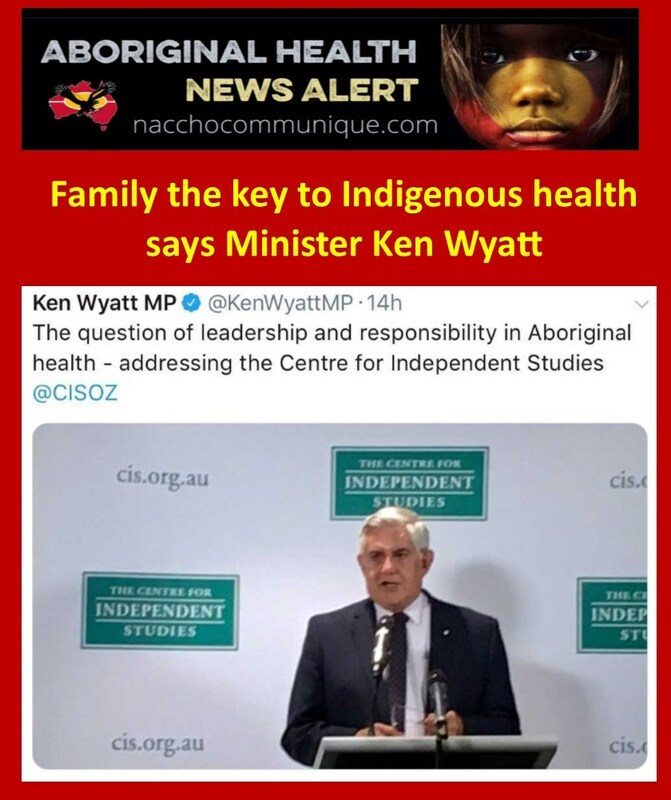 Aboriginal Liberal MP Ken Wyatt said the successes and the failures in indigenous health demonstrated that “responsible parents and families provide the most consistent and enduring interventions”. Calling for a declaration of “non-negotiable standards to be met from the bottom up”, Mr Wyatt said these standards must “reflect the pride of the oldest continuous culture on the planet” but should also extend “far beyond families, to health and community groups and organisations too”. He said there had for too long been a “piecemeal approach” to indigenous health, with “inadequate accountability” for repeated programs and yet “every time there’s been a new issue or challenge, ­people say we need more money”. Efforts to close the gap between indigenous and non-indigenous health outcomes would not succeed “until we eliminate the mindset that Aboriginal Australians could be, and even should be on occasions, dealt with differently”. The current syphilis epidemic in northern Australian indigenous communities, which has prompted the Turnbull government to commit $8.8 million in an attempt to turn its tide seven years after it began, was a case in point. “If this outbreak had occurred on Sydney’s north shore, in ­Cottesloe in Perth or Toorak in Melbourne — in any city or major town, in fact — there would have been a rapid response years ­earlier,” Mr Wyatt said. However, he cautioned that there must also be a greater focus on strategies that clearly work, calling for governments and NGOs to “hear the voices of families, of mothers, fathers and community elders, not just the voices of those who are the strongest ­advocates for the establishment of organisations or services”. He cited the work of Fitzroy Crossing women including Aboriginal and Torres Strait Islander Social Justice Commissioner June Oscar in curbing the spectre of ­fetal alcohol spectrum disorder, saying it had “turned the town around and you now see strong families there, bound by the glue of love and caring”. He had ordered his department to overhaul a Medicare provision designed for indigenous Australians that provides physical, psychological and social wellbeing assessments as well as preventive healthcare, education and other options to improve health. He said only 217,000 people ­accessed this provision last year but he wanted this number to rise because “what I want to see is all First Nations people accessing all relevant (Medicare) items in the same way other Australians do”. He praised the growing number of indigenous health professionals at all levels, “as doctors and nurses, in allied health, administration and management (and) in policy planning and research”. Mr Wyatt said this was likely to be the best hope for the future, with more than 40 per cent of the 720,000-strong indigenous population aged under 24, so that many of this group were “set to make a big impact across many fields that may help to close the gap”. Thank you Tom, [Switzer, Executive Director, Centre for Independent Studies] for your introduction. In West Australian Noongar language, I say kaya wangju – hello and welcome. At the same time, I acknowledge the traditional owners of the land on which we meet, the Gadigal people of the Eora Nation, and pay my respects to Elders past and present. Is it government or private investment; is it determination; is it personal motivation? To begin, I’d like those of us who can remember, to think back to 1972. Australia’s Helen Reddy was topping the international charts and we were getting out of Vietnam. The Tent Embassy went up at Parliament House in Canberra on Australia Day that year, a symbolic foreign mission erected in the fight for land rights, after years of dashed hopes – an embassy that continues today in the fight for equality. 1972 was a potentially life-changing year for thousands of Aboriginal and Torres Strait Islander Australians. Prime Minister Gough Whitlam established the Commonwealth Department of Aboriginal Affairs, ushering in an era of bold new promise, building on changes implemented by previous governments following the 1967 referendum. Looking back – in so many different ways since then – we have come so far. Yet, since 1972, we have not seen the broad, wholesale change that we would expect, especially given the significant funding and vast amount of good intentions that have been invested in Aboriginal affairs. Yes, for the first time in several years, we are on track to reach three of the seven Closing the Gap targets – but what lies behind the statistics that still highlight health inequities today? What have we got right – and wrong – since 1972? As I travel our nation, I see and hear more and more inspiring stories of First People’s achievement and the journey to equality, from almost every corner of the country. Perhaps I’m a bit old-fashioned, but I like to call these “jewels in the crown” – because they shine so brightly, and they exemplify the things that work. One of these is a university college for Aboriginal students I recently launched in Perth. Now doubling in size six years after it began, it boasts a 90 per cent retention rate, with almost 80 percent of students passing all their exams. Head to remote communities in the Kimberley and the Pilbara and you’ll find the EON program, literally teaching children how to grow vegetables and good health. This is especially close to my heart, because I approved the initial, modest, funding to help start the project 10 years ago. Since then, EON’s employed scores of local Aboriginal people, worked with students and families to create dozens of school vegetable gardens and has run countless cooking classes, including bush tucker, too. The compelling taste and health benefits of home grown food are one thing; but it’s the ownership, the healthy habits, the skills learned, and the pride that are also helping change young lives. The EON program’s now in high demand, extending further south in WA and into the Northern Territory this year. In the Western Desert, the Pintupi Luritja people saw the tragedy of kidney failure and decided it wasn’t going to be a one-way ticket off their beloved country, to being hooked up to dialysis in Alice Springs. They took control, famously painted and sold precious artworks – and raised a million dollars to start realising their dream. Eighteen years on, the Purple House project has treatment centres across their vast lands, a mobile dialysis truck and, just as important, a growing primary and preventive health care network. Not surprisingly, the wraparound approach – from the ground and the street up – most often shows the common denominator of success. This local impetus is being strongly supported, and replicated with careful community consultation, through significant Turnbull Government programs. Better Start to Life and its care and family partnerships begin a child’s health journey before conception. We have funded 124 sites nationwide, and counting. The results are showing fewer low birth weight babies, higher rates of breastfeeding and, in our Australian Nurse Family Partnership Program sites, 100 per cent immunisation rates, the highest in the nation. At the same time, from Alice Springs to Port Augusta and from Doomadgee to Canberra, the Connected Beginnings program links parents, health care and education, so children are ready to start school, learn and grow into healthy teenagers and adults. But sometimes, I go into communities and I meet with organisations that tell me they are meeting their health targets — the key performance indicators. I then get permission from Elders to walk around and chat with locals. On one particular occasion, in the Kimberley, I met a significant Aboriginal artist. We were walking along and a friend was talking with this painter and I noticed that her eyes looked opaque, so I asked her: How much can you see? At that time, it had been a two-year wait – yet the health organisation’s KPIs were being met. How could this be? In a country as rich and advanced as Australia, how can this happen? This is not an isolated incident. Improving overall Aboriginal and Torres Strait Islander health is, first and foremost, critical for the well-being and dignity of hundreds of thousands of First Australians. But it is also fundamental to our nation’s commitment to equality, and our global health status. The health of First Nations Australians is everyone’s business. We must continually celebrate with Aboriginal communities and families the many milestones in health, education, careers and cultural achievement. At the same time, it is crucial we look carefully at where poorer aspects of health and wellbeing remain. In these cases, doing more of the same is an option we can no longer afford – the high cost in lives and lost futures is incalculable, and budgets are also under intense pressure. First Nations knowledge is embedded in the memories of the living – knowledge that is imparted through teaching, storytelling, music, art and dance. They are our living libraries and losing each individual means a precious book of knowledge is lost forever. It is imperative that we enable people to be healthy and live longer. For far too long in Aboriginal health there was a piecemeal approach; series upon series of programs, often with inadequate accountability. Every time there’s been a new issue or challenge, people say we need more money. Currently, there are two evaluations underway to identify opportunities to improve; access to quality and effective primary health care services; assess health gains; and identify the social returns and the broader economic benefits of the Indigenous Australians’ Health Program. While Government investment in the program will continue to grow over the forward estimates, it is imperative – especially for those in greatest need – that we maximise the health value in every dollar. To illustrate this point I want to look at the current challenges of Sexually Transmitted Infections and Blood Borne Viruses. Recently, I was asked to approve significant special funding for a targeted program to tackle the increasing prevalence of STIs, particularly the alarming rise of syphilis in northern areas. When I asked ‘What are the States and Territories doing about this?’ I was disturbed to find too little had been invested and too little done when the first warning signs appeared, almost seven years ago – certainly not to the extent I would have expected from the responsible jurisdictions. There was still an overwhelming reliance on Commonwealth leadership and funding in order to address the spread of STIs across the Top End. I committed $8.8 million dollars, to provide a surge approach that is currently ramping up, aiming to turn the tide of infection. I also make the point that these First Nations people now struggling under the burden of this deadly disease are, first and foremost, citizens of Australia. If this outbreak had occurred on Sydney’s North Shore, in Cottesloe in Perth, or Toorak in Melbourne – in any city or major town, in fact – there would have been a rapid response years earlier. I believe there will not be complete success, in terms of Closing the Gap, until we eliminate the mindset that Aboriginal Australians could be, and even should be on occasions, dealt with differently. Ensuring awareness and respect for First Nations people and culture throughout our health system may be critical to equality of access – but above all, there is a fundamental human right we must accord every one of our citizens, and that is the right to good health. A doctor based in Kintore – around 2,000 kilometres South-West of Darwin visited the community of Kiwirrkurra located in Western Australia’s sandhill country — the Gibson Desert. Today, we hear a different narrative too often: There is an alarming rise in obesity and diabetes, suicide levels are high, there is alcohol and drug misuse and the impacts of poverty leave many people with a sense of powerlessness. Too often, First Nations people’s achievements are overshadowed by health and welfare stories of deep, and understandable, concern. We’re seeing laudable improvements because of interventions, but they’re not always consistent enough, and they’re often not equivalent to results achieved by other sectors within multicultural Australia. I’m strongly focussed on where we need to improve; on why – even after accounting for the social and environmental impacts on health – we’re still seeing better outcomes for non-Aboriginal people. For almost 20 years now, the Medicare Benefits Schedule (MBS) has included Item number 715 – a health assessment especially designed to ensure Aboriginal and Torres Strait Islander people receive primary care matched to their needs. A 715 looks at a patient’s health — physical, psychological and their social wellbeing. It also assesses what preventative health care, education and other assistance should be offered to improve health and wellbeing. It’s holistic. Not body part, by body part. The whole body. Australia’s Aboriginal and Torres Strait Islander population is around 720,000. Yet only 217,000 people in 2016-17 have been assessed under MBS Item 715. At the same time, I see organisations such as the Institute for Urban Indigenous Health, that according to their 2016-17 Annual Report have over 33,000 active patients, of which approximately 60 per cent have had their 715 health check. In 2016-17, the organisations Members’ Network of 19 Aboriginal Community Controlled Health Care Clinics generated more than $14.3 million in Medicare income, with all funds re-invested in the delivery of comprehensive health care for Aboriginal and Torres Strait Islander people in South East Queensland. What I see here are significantly better results, through completion of a “cycle of care”, comprising the range of chronic disease and other MBS items. The Institute has grown its clinics from 5 to 19 in the past nine years, with their 20th soon to open in the Moreton Bay region. I’m excited by this work – the innovation and capacity to change, and the resolve not to accept the status quo of poorer health outcomes. I look at some of the health disparities and think, why aren’t we as a nation case managing, fundamentally, 720,000 people in a way that would make a difference to so many chronic conditions? I have asked my department for an overhaul of 715s – what I want to see is all First Nations people accessing all relevant MBS items in the same way that other Australians do. A key Government focus is on the health of our children, from conception right through to their late teens, so they can grow into strong and healthy men and women who can be the best mentors for their own children. With more than 1700 First Australians receiving kidney dialysis, and rheumatic heart disease affecting another 6,000 mainly younger people, this year I’ve also prioritised renal health and RHD, along with eye and ear health. From four national roundtables, we’re now charting Australia’s first roadmaps to coordinate efforts to combat these debilitating and deadly conditions. It’s absolutely intolerable that RHD among our First Nations people is happening at more than 50 times the rate of other groups in Australian society. In parts of the Northern Territory, those horrific rates of RHD are doubled again. And Aboriginal and Torres Strait Islander people under the age of 55 are starting dialysis at twice the rate of non-Aboriginal Australians, with many showing danger signs in their teens. The unfinished business of today is disappointing because we should be celebrating more successes. And are community-controlled health organisations and other community groups established to service great need, sitting down enough and asking families and individuals what they know, what they want and what they think would work best? They must ask: Where is the continuity of service for anyone who requires an intervention to prolong their life or to circumvent an illness? Minor ailments like skin sores or strep throats, if treated consistently and effectively, won’t develop into early onset renal failure or rheumatic heart disease. In the same way, neither will ear infections become impaired hearing, that can stunt a child’s learning capacity and their chances of a good job, or any job at all. There is a need for a holistic approach to the health of each individual. Some of the benefits flowing from Australia’s recent mining boom have been great employment opportunities, close to country, for thousands of First Nations people. But the job hopes of many were hampered by deafness contracted in childhood, much to the frustration of mining companies committed to hiring keen local staff. Hearing and communication are fundamental to fulfilling our life’s potential. They’re also two of the most valuable commodities for sustainable change in Aboriginal and Torres Strait Islander health. Governments and non-government organisations across the board must listen to and hear the voices of families, of mothers, fathers and community Elders. Not just the voices of those who are the strongest advocates for the establishment of organisations or services that, theoretically, should make a difference on the ground. I say this with no political overtones – the Prime Minister and the Turnbull Government are committed to doing things with Aboriginal and Torres Strait Islander people, not to them. Last year, we led a massive group listening program – the My Life My Lead consultations involved 600 people at 13 forums across Australia, plus more than 100 written submissions were received. Policies and services that reflect local voices and wisdom are more closely owned by the people they serve. People are empowered, because they’ve been heard, and take responsibility because they’re respected and proud. Around the nation there are many things that are working and I have seen programs and services where Aboriginal organisations, Aboriginal people and non-Aboriginal people are highly successful in the most difficult of circumstances. I see June Oscar and her community’s work in Fitzroy Crossing, which has changed the whole dynamic of buying alcohol and curbed the local tragedy of Foetal Alcohol Spectrum Disorder. Together, they have turned the town around and you now see strong families there, bound by the glue of love and caring. Alcohol and the bad behaviour of a few no longer defines Fitzroy Crossing, the strength and the story of the community does. When I think about the successes, as well as the failures, I know that responsible parents and families provide the most consistent and enduring interventions. Funding for health programs and services, from public or private sources, will only ever be part of the currency of change. By far the greatest value will come from every mother, father, uncle, aunt and Elder every day, taking responsibility for and contributing to better health. For over 65,000 years, First Nations people survived and thrived without a plethora of organisations – individual families and communities pulled together, to ensure the health and wellbeing of all. Working and walking together with local communities, we collectively need to declare non-negotiable standards to be met, from the bottom up. Standards that also reflect the pride of the oldest continuous culture on the planet. This individual responsibility extends far beyond families, to health and community groups and organisations, too. Everyone working to close the gap in health equality must look at themselves and say: Together, we have outcomes to achieve – what difference are we really making today and how can we do better? We must constantly walk around the communities we serve and look for patterns of disparity. If that’s what we’re seeing, the question should be: Are we fighting our own people? Are we listening enough? Fortunately for the future, increasing numbers of young First Nations people are hearing the call to lead the next wave of change. With more than 40 per cent of our Aboriginal and Torres Strait Islander population aged under 24, large groups – like the undergraduates I met recently at the university college – are set to make a big impact across many fields that may help close the gap. Through concerted programs around the country, there’s also a growing number of First Nations health professionals at all levels – as doctors and nurses; in allied health, administration and management; in policy, planning and research. My message to them and to all Aboriginal and Torres Strait Islander people, in communities across this nation, is that we are proud descendants of those who came here at least 65,000 years ago. We have proven incredibly resilient, and we’ll continue that tradition of resilience, and respect for our country and for all Australians. But the strength of our cultural identity will always remain the basis for our health – and what we strive for and live for. I am not sure if you can assist me, however I wanted to check if it is possible for NACCHO to promote in your media update posts today/this week, the 2018 WA State Sector Conference which is occurring today and tomorrow at Fremantle. The State Sector Conference will include the launch, by Indigenous Health Minister Hon. Ken Wyatt, the AHCWA Western Australia Aboriginal Youth Health Strategy 2018-2023, Todayâs young people, tomorrowâs leaders. If you would let me know I am happy to send further information â including media statements we have prepared for the event. This email and all attachments (if any) are intended for the use of the addressee only and may contain information which is confidential or privileged. If you are not the intended recipient please disregard the contents and advise the sender immediately either by email or by telephoning +61 (08) 9227 1631. Be aware that any copying, disclosure or use of this email and any attachment by anyone other than the intended recipient is prohibited.